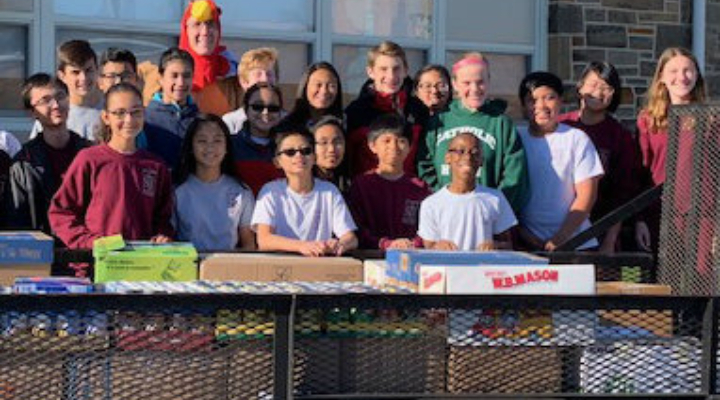 This Thanksgiving season, St. Joseph School-Fullerton school families were challenged by their principal, Ken Pipkin to bring in 5,000 canned goods to support the St. Clements Food Pantry. If the goal was reached, Mr. Pipkin offered to wear a turkey costume for the entire school day. The families responded by collecting over 6,000 cans! Two huge trucks and a trailer pulled up in front of the school and students from the school's National Junior Honor Society, who spearheaded this drive, loaded the cans for delivery. According to Mr. George Romig, coordinator from the St. Clements Food Pantry, many families in need will get the help they need this holiday season thanks to this colossal donation. The trucks left the school parking lot with tires a little closer to the street, but on their way to helping many families in need.